Most states have national anthems. Just as states come in all shapes and sizes, so there is a great variety in anthems. Some (such as Spain) have no words at all; others, (in states with multiple national languages, such as South Africa) are multi-lingual. Given that Article 8 of the Irish Constitution provides that the Irish language is the first official language of the State, and that the English language is recognised as a second official language, it is unsurprising that the national anthem comes in both official languages. However, the story of the emergence of both versions is not straightforward. In my previous post, I discussed “The Soldier’s Song”, the music and English language version of the national anthem. In this post, I want to discuss “Amhrán na bhFiann”, the Irish language version of the anthem. The stories are fascinating but tangled; and, as I said in my previous post, I discussed some of them on the Marian Finucane show on RTE Radio 1 last Sunday morning (listen here). Since then, I was also The Last Word with Matt Cooper on TodayFM yesterday evening (listen here). In both cases, I was discussing Senator Mark Daly‘s National Anthem (Protection of Copyright and Related Rights) (Amendment) Bill 2016 (reviving a Bill that he had introduced into the last Seanad earlier in the year). By way of background to a detailed discussion of Senator Daly’s Bill in my next post, I discussed in my previous post some of the copyright issues that have arisen relating to the music and English language version of the national anthem. The chorus of “The Soldier’s Song” was adopted as the national anthem in 1926. Following deals in 1933 and 1965, the State owned the copyrights in the music and the English language version of the anthem. These copyrights persisted until 1 January 2013, when they lapsed by effluxion of time in the usual way. However, the English language version quickly lost out to “Amhrán na bhFiann“, the Irish language version of the anthem, which is now almost invariably sung instead, even though there seems to be no government decision formally approving this practice. And the copyright issues relating to “Amhrán na bhFiann” are just as knotty as those relating to “The Soldier’s Song”. “Amhrán na bhFiann” was composed by Liam Ó Rinn (pictured above left) – probably in 1923 – as a fairly free translation of Kearney’s English language text of “The Soldier’s Song”, and the versions in both languages are sung to Heeney’s tune. There is nothing in any of the sources to which I have access and linked in these posts to suggest that Ó Rinn sought or obtained permission from Kearney or Heeney, let alone both. However, if section 154(2)(a) of the 1927 Act applied, Kearney would not have been able to assert his copyright to prevent an Irish language translation more than 10 years after “the date of the first publication” of “The Soldier’s Song” unless he had himself within that period published an Irish language translation. Kearney’s text was first published in 1912, and the 10 year period ran until 1922. Hence, if Ó Rinn had composed and published “Amhrán na bhFiann” in 1923, Kearney could only have restrained it as a breach of copyright if he (Kearney) had published his own Irish language translation before 1922, which he had not. If so, then, by 1927, when section 154(2)(a) came into effect, Ó Rinn’s “Amhrán na bhFiann” would not have infringed Kearney’s copyright in “The Soldier’s Song”. 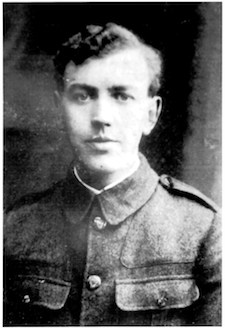 There is some suggestion that Ó Rinn might have composed “Amhrán na bhFiann” as early as 1917. However, Councillor Nial Ring, Ó Rinn’s grand-nephew, has told me that the family’s view is that, whilst Ó Rinn may have started on the translation around 1917, other activities (both political and personal) suggest that he would not have finished it then, and that he may not have been able to return to it and finish it until 1923. If he had published it in 1917, then it would have been within the 10 year window provided by section 154(2)(a), and Kearney could have restrained it as a breach of copyright. There is no record that he ever sought to do so. And it is far far more likely that he finished and published “Amhrán na bhFiann” in 1923, outside of the 10-year window, with the result that it would not have infringed Kearney’s copyright in “The Soldier’s Song”. Section 154(2) was amended in 1929 (but not in a way that changes the analysis here), and again in 1957 (reducing the ten-year period to seven years). However, the following year, section 154(2) (as amended) was repealed by section 2(1) of the Industrial and Commercial Property (Protection) (Amendment) Act, 1958. And section 2(2) went on to provide that, where the right to translate a work into Irish ceased to exist by virtue of section 154(2) of the 1927 Act, that right would “again subsist as part of the copyright in that work for the remainder of the term for which such copyright subsists”. As we have seen in my previous post, in 1958, that term would have been the life of the author plus fifty years (which in Kearney’s case meant until 1 January 1993), and that was extended in 1995 to the life of the author plus seventy years (which in Kearney’s case meant until 1 January 2013). Hence, from 1958 until, first, 1 January 1993 and, then, 1 January 2013, the State as holder of Kearney’s copyright could have asserted that Ó Rinn’s “Amhrán na bhFiann” was an infringement of copyright in “The Soldier’s Song”; and it could thereby have effectively obtained Ó Rinn’s copyright in “Amhrán na bhFiann”. Of course, this did not happen; and I think it is safe to assume that no-one at any stage considered Ó Rinn’s “Amhrán na bhFiann” to be an infringement of copyright in Kearney’s “Soldier’s Song”. 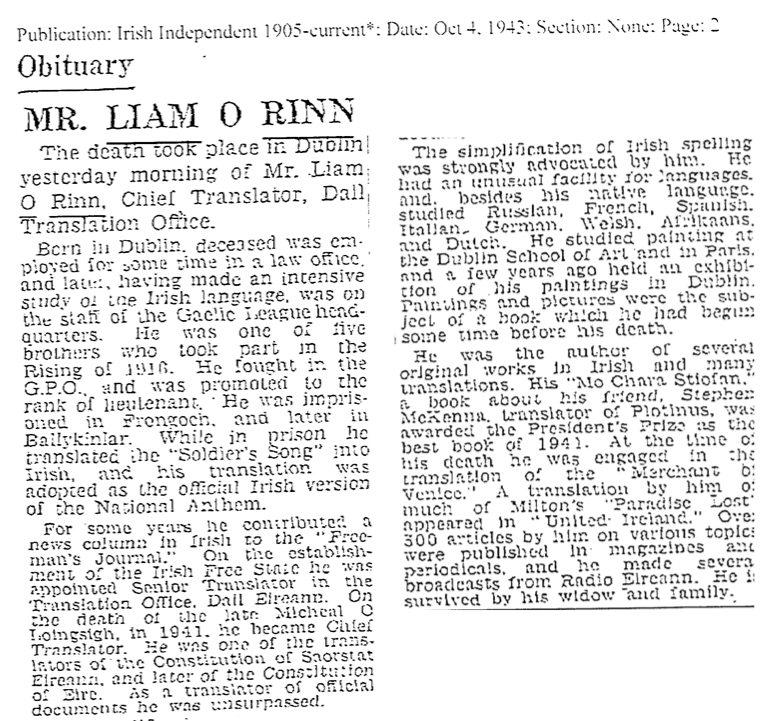 Moreover, Ó Rinn’s translation was also covered by its own copyright, the duration of which depends upon when he died. His dates are given in the Taoiseach’s Department’s sheet music (pdf) (reproduced in my last post) as 1888-1950, but they are given in Wikipedia and other sources as 1886-1943. Applying the “life of the author plus seventy years” formula, if he died in 1950, then his lyrics will come out of copyright on 1 January 2021, whereas if he died in 1943, then his lyrics came out of copyright on 1 January 2014. 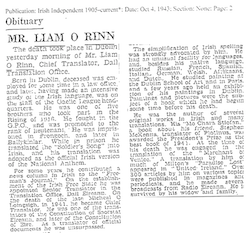 I thought it likely that the dates on the sheet music are a misprint; Councillor Ring has confirmed to me that this is indeed the case, and that Ó Rinn was born on 20 November 1886, and died on 3 October 1943 (his obituary, pictured right, appeared in the Irish Independent the following day). This means that copyright in “Amhrán na bhFiann” expired at the latest on 1 January 2014. The 1933 and 1965 deals done by the State relating to Heeney’s music and Kearney’s words of “The Soldier’s Song” did not cover Ó Rinn’s “Amhrán na bhFiann”. This was probably just about understandable in 1933, as “Amhrán na bhFiann” had not by then supplanted “The Soldier’s Song” in popular usage. But it was less understandable in 1965; even if that year’s deal was supplementary to the 1933 deal, it is still odd that no-one thought to include “Amhrán na bhFiann” in the 1965 deal. It may have been thought that, since Ó Rinn worked in the translation department of the Free State Oireachtas (Parliament), copyright in his works vested in the State as his employer. Councillor Ring confirmed to me that the family’s understanding is that Ó Rinn did the translation as part of his job in the the translation department of the Oireachtas. At first blush, the dates don’t quite work out. Ó Rinn’s bio (in Irish) on Ainm.ie says that he published “Amhrán na bhFiann” in November 1923 but did not begin working for the Oireachtas until “around” March 1924. Of course, the nascent Free State was really only finding its feet at the end of 1923 and the beginning of 1924, so he may already have commenced work for the State on various projects before November 1923 but only formally made it on to the books in March 1924. Councillor Ring’s view is that it is likely that it was only when Ó Rinn got the job in the Oireachtas that he had the time to be able to concentrate upon, and to finish, “Amhrán na bhFiann”. Councillor Ring also suggests that it is very likely that Ó Rinn did some preliminary work for the State in 1923 before going to the translation department of the Oireachtas. There are many gaps in Ó Rinn’s history. Perhaps the most dangerous to a coherent understanding of the copyright issues relating to “Amhrán na bhFiann” is the period in late 1923 and early 1924 before Ó Rinn was clearly employed by the translation department of the Oireachtas. (The “gap of danger” is the “bearna baoil” which appears in both versions of the anthem; it is the only Irish phrase used by Kearney in “The Soldier’s Song”, and it is repeated verbatim by Ó Rinn in “Amhrán na bhFiann). All in all, the best conclusion here would seem to be that copyright in “Amhrán na bhFiann” vested in the State as Ó Rinn’s employer, and that it expired at the latest on 1 January 2014. Indeed, it may have expired earlier. Section 168 of the 1927 Act provided that copyright in works “prepared, printed, or published … by or under the direction of the Government … shall … belong to the Government … and shall continue for a period of fifty years from the date of the first publication of the work” (section 51(3)(b) of the Copyright Act, 1963, and section 191(4) of the Copyright and Related Rights Act, 2000, are to the same effect). The first publication of “Amhrán na bhFiann” was, at the latest, 3 November 1923; so 1 January after 50 years after that date is 1 January 1974. If the State owned copyright in “Amhrán na bhFiann” as Ó Rinn’s employer, then it will have come out of copyright as early as 1 January 1974. On the other hand, if he did not compose “Amhrán na bhFiann” whilst he was an employee of the State, then the State could not for that reason claim copyright in it. Nevertheless, it may be that, at some stage during his employment, he assigned his copyright to the State. If he had done so, then for the reasons set out above, this copyright would have expired on 1 January 2014. However, this is not spelled out in any of the sources that I have consulted and linked to here. Moreover, the State has not claimed that copyright. This was made clear by Michael Noonan TD, Minister for Finance, in the Dáil on 3 May 2011, when he said that the “state does not hold copyright in respect of the various Irish language translations that have been made since 1917”. In summary, then, the story of the copyright in the national anthem (the music, the English language lyrics, and the Irish language lyrics) is a tangled one. But the position in which we now find ourselves is entirely clear. As I explained in my previous post, the State eventually came to own the copyright in the music and English language version (“The Soldier’s Song”), and this copyright persisted until 1 January 2013. If the State never owned the copyright in the Irish language version (“Amhrán na bhFiann”), then will have remained with Ó Rinn, and it will have persisted until 1 January 2014. On the other hand, if – as seems far more likely – the State did own that copyright by virtue of Ó Rinn’s employment with the Oireachtas, then it will have persisted only until 1 January 1974. Consequently, all copyrights in the national anthem have come to an end. Re-imaginings of the national anthem are therefore entirely possible, and indeed ought to be encouraged. Senator Daly’s Bill would prevent this by reviving the copyrights in the music and the English language version – though, curiously, not the Irish language version – “for an indefinite period”. This is a thoroughly bad idea, which should not become law, and I will explain why in my next post. Note: This post was carved out of my previous post and updated. I am grateful to Councillor Ring for his help with this post, and in particular for the images above, which are reproduced here with permission and thanks.